Approximately 100 individuals from faith traditions across Winston-Salem came together Sunday, September 30, 2018 for Interfaith Winston-Salem's first annual Bridge Builders Dinner. They honored Jerry McLeese, the founder of Interfaith Winston-Salem who has worked for many years to build bridges of understanding and mutual respect among those of different faiths, beliefs, and viewpoints. Michael Lange served as master of ceremonies. 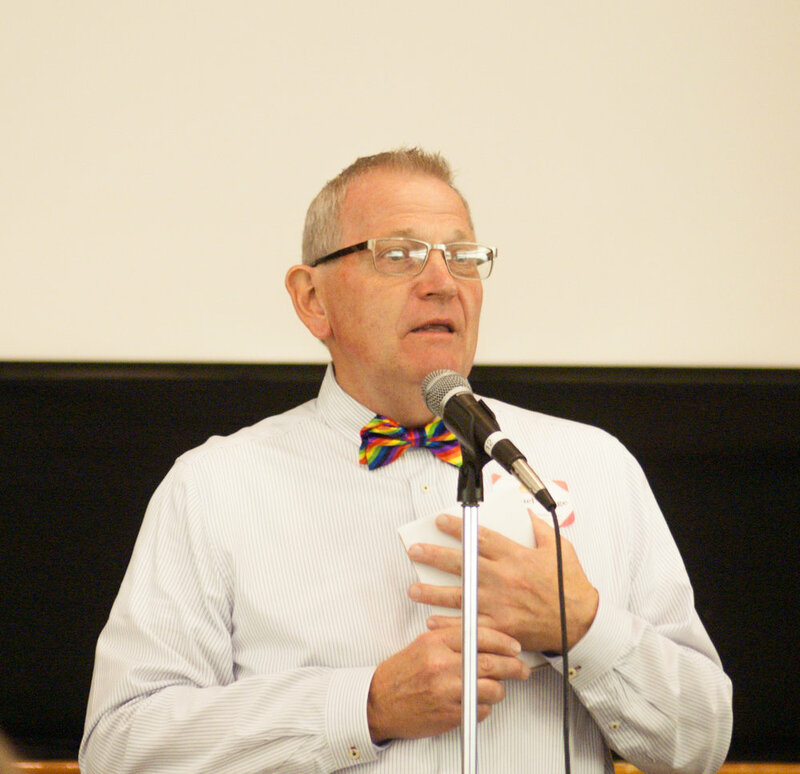 Truman Dunn, current chairperson of the board of Interfaith Winston-Salem, and Jim Collins, a member of the board, gave background on the organization and its work. Local faith individuals and groups were featured in commenting on Jerry’s work. They included Art Bloom of Temple Emanuel, an original board member; Ibrahim Thompson of the Annoor Islamic Center; Pam Lepley of the Unitarian Universalist Fellowship; Rabbi Mark Cohn of Temple Emanuel; Sita Soma of Sri Mata Hindu Temple and a member of the board; Imam Joe’l Saahir of Masjid al-Mu-Minun and a board member; Rev. Lisa Schwartz of the Unitarian Universalist Fellowship; Rev. Kelly Carpenter of Green Street United Methodist Church; Imam Khalid Griggs of The Community Mosque of Winston-Salem; and members of the Faith in Action Sunday School Class at Ardmore United Methodist Church. Providence Catering, a program of Second Harvest Food Bank, catered a full buffet dinner. Knollwood Baptist Church was the host. The event was sponsored by Annoor Islamic Center, The Community Mosque of Winston-Salem; the Faith in Action Class at Ardmore UMC; Green Street UMC; Sri Mata Hindu Temple; Home Moravian Church; Masjid al-Mu’Minun; Parkway UCC; St. Anne’s Episcopal; Temple Emanuel; the Unitarian Universalist Fellowship of Winston-Salem; Wake Forest University Department for the Study of Religions; and the Winston-Salem Dharma Community. The Bridge Builders Dinner will become an annual fundraising event for Interfaith Winston-Salem and will honor individuals who have made significant contributions to building bridges across differences that separate our community. Students at Meadowlark Elementary School in Winston-Salem dedicated their new Compassion Corner bench October 5, 2018 with a total-school celebration in the gymnasium. Essays or poems by Daniela Samaneigo, Remy Conwell, Ava Bourgeois and Drew Davis were chosen to be read at the dedication. Tyler Burton read a poem on Compassion written by School Counselor Karen Browder as students held up letters that spelled C-O-M-P-A-S-S-I-O-N. The poem was based on discussions she had during Guidance classes with third-, fourth- and fifth-graders on the topic of Compassion. The Compassion Corner project is a sponsored by Interfaith Winston-Salem through its Compassionate Winston-Salem movement. The goal is to place the benches and programs of compassion in all elementary schools in Winston-Salem/Forsyth County Schools. Compassion. Compassion is something that cannot be broken. It cannot go extinct. It cannot be forgotten. It is a melody that people hum when they do the right thing. Bullies may be horrible but you can speak up – you DO have a voice. When we show compassion we have empathy. This word is more valuable than a million dollars. It means to have felt how someone else is feeling…to truly understand. When my grandfather passed away, my best friend, Ava, had been through the same thing. She understood how I was feeling! She cheered me up by being her pink bow-wearing bubbly self! Compassion. This word is worth more than we can imagine, so show compassion everyday!!! But what does it really mean? Let’s see. Someone steps up to burst their tough times bubble. And coming up with ways to help them feel glad. Bullying is not nice; in fact it is very rude. But compassionate people can change the mood. Once I noticed my friend curled up head to knees. She told me her pet had died, her pup. I sat down beside her, showed her some love, and then she cheered up. You see, compassion is an action and not just a word. It shows you care and lets others be heard. Empathy, love and Compassion go a long way. I think that compassion is showing that you care. It’s understanding feelings and being willing to share. Listening to others’ thoughts and words and helping along the way. So join someone on the Compassion Bench, include them and have fun! I think if we do more small things in a compassionate way, we could make a big difference. Some examples of ways that we can spread compassion at Meadowlark may include inviting someone to play with you who usually doesn’t or sitting with someone in the cafeteria who is eating alone to even just saying good morning to someone in the hallway. You never know what they have been through and that small gesture may turn their day around. Within the word “compassion” is the smaller word “compass.” If we always use our moral compass to guide our actions in the right direction, these small things can become great and change the world! C is for the CARING that you should show every day. O stands for OFFERING help when needed along the way. M is for MAKING everyone feel loved from the heart. P is for PATIENCE you should offer from the start. A stands for ACCEPTANCE and including everyone. S is for SHARING the load, to help get a tough job done. S is for SINCERELY listening to a friend who is in need. I stands for being INTERESTED, and doing a good deed. O is for being OPEN to those who are different from you. Each spring, Interfaith Winston-Salem organizes a tour that visits three houses of worship. Included in the sites visited are a mosque each year, the Jewish temple every other year, and an orthodox worship center every other year. In 2019 the tour will visit the Annoor Islamic Center; Forsyth County’s first Hindu temple, the Sri Mata Hindu Temple; and Temple Emanuel, a Reform Judaism worship center. Although adults are encouraged to attend, the focus is on youth in middle and high schools. The tours conclude with a free pizza party. Contact interfaithws@gmail.com. Children in kindergarten through the fifth grade learn about multiple cultural and faith traditions through arts, crafts, music, dance, food and other disciplines during this Sunday afternoon event each autumn. The projects include Buddhist prayer flags, fish designs for Christianity, Arabic calligraphy from Islam, symbols from the Day of the Dead, elephant idols from Hinduism, menorahs from Judaism and many others. The 2018 festival on Sunday, November 4 at Highland Presbyterian Church will be our seventh annual event. Contact interfaithws@gmail.com. Interfaith Winston-Salem and Compassionate Winston-Salem sponsored an Interfaith Good Neighbor Team in collaboration with World Relief to help resettle a refugee family from Ethiopia in Winston-Salem. Volunteers came from several faith traditions. Contact interfaithws@gmail.com. With high school students playing a key role, Interfaith Winston-Salem is organizing Interfaith Service Clubs in local high schools. The clubs focus on respect for religious identity, mutually inspiring relationships and common action for common good. Students at Reynolds High School began the first club in 2016-17. Contact interfaithws@gmail.com. On the third Friday of each month, a diverse group of Compassionate Winston-Salem volunteers prepares and serves a hot meal to overnight guests of the Bethesda Center, one of Winston-Salem’s homeless shelters. There is a variety of ways to become involved. Contact interfaithws@gmail.com. Just over three years after their sign was sprayed with more than 60 buckshot, leaders of the Sri Mata Hindu Temple are inviting the public to an open house at their new temple 2-5 p.m. Sunday, September 9 at 8535 Lasater Road in Clemmons. The temple is Forsyth County’s first Hindu temple. In the past, local Hindus have driven to eastern Guilford County, 50 miles from the current location, for worship services. The new structure, a gleaming white brick, 3,600 square foot one-story structure, sits on a 7.6-acre tract on this quiet stretch of rural road in western Forsyth County. Temple leaders are calling the open house an “Afternoon of Gratitude” to express their thanks for the outpouring of goodwill from the community following the defacement of the sign that announced plans for the temple. Special invitations have been issued to members of nearby Christian and Muslim worship centers. Sri Mata Hindu Temple has completed its first phase, which contains the main temple based on the “Panchayatana Style” (adopting the five Gods structure). Statues of deities, under creation in India, are expected to be delivered to Clemmons later this year. The Open House program begins at 2 p.m. with a period of socializing followed by a description of the temple at 2:15 and a tour at 2:45. A question-and-answer period precedes light refreshments at 4 p.m. The Forsyth County Sheriff’s Office and neighbors across the county responded to the shooting incident in 2015 quickly. No determination was made on whether the action was intended to intimidate the congregation or was simply an act of vandalism. Several nearby churches, local community leaders and individuals representing other faith traditions have provided continuing support since the shooting. Approximately 500 Indian families live in Forsyth County with many of them followers of the Hindu faith. Hinduism is generally recognized as the world’s oldest organized religion, dating back more than 4,000 years. Hinduism is the third largest religion with 900 million adherents, most of them in India. Christianity and Islam are larger. For additional information, contact Sri Mata Hindu Temple by email at info@matahindutemple.org. · Collaborating with other community organizations to promote interfaith learning experiences. · Cultivating the potential for compassion that lies in all of us. Each spring, Interfaith Winston-Salem organizes a tour that visits three houses of worship. Included in the sites visited are a mosque each year, the Jewish temple every other year, and an orthodox worship center every other year. Although adults are encouraged to attend, the focus is on youth in middle and high schools. The tours conclude with a free pizza party. Contact interfaithws@gmail.com. Children in kindergarten through the fifth grade learn about multiple cultural and faith traditions through arts, crafts, music, dance, food and other disciplines during this Sunday afternoon event each autumn. The projects include Buddhist prayer flags, fish designs for Christianity, Arabic calligraphy from Islam, elephant idols from Hinduism, menorahs from Judaism and many others. The 2017 festival at The Enterprise Center Nov. 5 will be our sixth annual. Contact interfaithws@gmail.com. Interfaith Winston-Salem provided the impetus in 2013 for the City of Winston-Salem to become only the 18th city in the world to sign the Charter for Compassion. Our Compassion Corner project has placed benches on playgrounds at more than 10 local elementary schools. We assisted in creation of Triad Restorative Justice, a new nonprofit that is introducing restorative practices to the commumity. Contact Truman Dunn tldunn104@gmail.com. In an effort to bring improved understanding between Muslim and Christian neighbors, we began a series of gatherings in summer 2017. The goal is to create learning and relationship-building opportunities for Christians whose perceptions and fear of Muslims has intensified in the current political climate. Contact Truman Dunn tldunn104@gmail.com. Interfaith Winston-Salem and Compassionate Winston-Salem are sponsoring an Interfaith Good Neighbor Team in collaboration with World Relief to help resettle a refugee family from Ethiopia in Winston-Salem. Volunteers come from several faith traditions. Contact interfaithws@gmail.com. With high school students playing a key role, Interfaith Winston-Salem is organizing Interfaith Service Clubs in local high schools. The clubs focus on respect for religious identity, mutually inspiring relationships and common action for common good. Students at Reynolds High School began the first club in 2016-17 and a club is planned at West Forsyth High School for 2017-18. Contact interfaithws@gmail.com. Winston-Salem will celebrate its interfaith response to the global refugee crisis Saturday, October 21 with an afternoon of activities for children, youth and adults. “Refugees, Neighbors, Friends—An Interfaith Celebration” will be held at Knollwood Baptist Church, 330 Knollwood St., in Winston-Salem from 1 p.m. until 4 p.m. The event will involve families of refugees who have resettled in Winston-Salem and volunteers who are helping refugees make this their new home. Admission is free and the wider community is invited. Stephan Bauman, former President and CEO of World Relief, will deliver the keynote address at 3 p.m. World Relief, which has offices in High Point and Winston-Salem, is one of 10 agencies in the United States that works through the United Nations to resettle refugees. Bauman currently is executive director of the Cornerstone Foundation, which serves people in the least resourced and accessible places of the world. The United Nations estimates that there are more than 65 million people forcibly displaced from their homes, including over 22 million people classified as refugees. Winston-Salem’s refugee resettlement effort has involved participation by members of Muslim, Jewish, Christian and other faith communities, often working together. In recent years, they have helped make Winston-Salem home for more than 300 individuals from The Congo, Sudan, South Sudan, Burundi, Ethiopia, Eritrea, Mali, Chad, Iraq, Afghanistan, Syria, Myanmar, Bhutan, Vietnam, Yemen, Somalia, and Cuba. “Knollwood is honored to host this celebration of both refugees and local people who are working to ease the worst humanitarian crisis of our time,” said Dr. Bob Setzer, pastor at Knollwood. "As the three great Abrahamic faiths -- Judaism, Christianity, and Islam -- teach us, in welcoming the stranger, we welcome God." The celebration is sponsored by the Rice-Cunningham Fund of Knollwood Baptist Church and the Carlton Mitchell Interfaith Series of Interfaith Winston-Salem. With much anxiety and full of hope, our Interfaith Good Neighbor Team on Thursday will welcome a refugee family from Ethiopia. The team has committed to work closely with the family over the next six months to ease resettlement into their new community. The family includes a single mother, age 33; boys ages 4 and 9; and a girl age 6. The family is being placed through the High Point/Winston-Salem offices of World Relief, one of nine resettlement agencies approved by the federal government. Volunteers will stock the apartment with furniture and supplies, assist with applying for Social Security cards; assist in seeking employment opportunities; assist in registering with the Department of Social Services for food stamps (SNAP), Medicaid, etc. ; assist with initial health assessments and securing primary care providers; assist in setting up bank accounts and paying bills such as rent and utilities; and many other activities. Volunteers and friends have contributed over $2,000 to World Relief to help cover operational expenses, and Interfaith Winston-Salem, through its Compassionate Winston-Salem program, has set aside $1,000 to help the family create a home in this community. The interfaith volunteers began meeting in February to explore the possibility of forming a Good Neighbor Team. Each member has completed a formal application, has participated in four hours of orientation and training and has had a background screening. Members of the team are Brooke Suiter, Carolyn Coram, Jerry McLeese, Jo Ann Mount, Johnne Armentrout, Joy Troyer, Judith Saxton, Judy Greene, Kate Weaver (and Ella and Cole), Kathy Watts, Nancy Gould, Sarah Blackwell, Shereen Abdelfattah Gomaa, Tasha Strupe and Truman Dunn. Others will be joining the team. For more information contact interfaithws@gmail.com. With the leadership from Noor Shehata, West Forsyth High School will begin an Interfaith Service Club this fall. Noor, a rising senior at West, has identified two sponsors for the club and will work on creating a club constitution and goals for the group. West Forsyth joins Reynolds as Winston-Salem/Forsyth County schools with interfaith service clubs. Isaac Cooper, who is a member of Temple Emanuel, led the formation of a club at Reynolds this spring. He is a rising junior. Interfaith Winston-Salem has also begun discussions with a student at Mount Tabor High School to explore the possibility of forming a club there. Interfaith Winston-Salem assists students with formation of the clubs, which are based on the model created by the Interfaith Youth Core (IYFC), headquartered in Chicago. IYFC’s model on more than 200 college and university campuses features three core components of interfaith cooperation: respect for religious identity, mutually inspiring relationships and common action for common good. Students, faculty or staff who are interested in forming an interfaith service club in their school can contact Interfaith Winston-Salem for more information at interfaithws@gmail.com. The frequency of hate crimes and the number of hate groups in the U.S. has grown at an alarming rate over the last year. Although virtually every minority and marginalized group has been affected, the Southern Poverty Law Center says that the Muslim community has been targeted most often. The meeting included a presentation on “a supposed Muslim plot to conquer the United States,” media reports said. “Shed some blood, too,” the same participant said in response to the presenter’s call to “shed some light” on the issue, according to the council. As an organization created to bring peace through understanding, Interfaith Winston-Salem has a responsibility to address the root causes of the hate and to work to improve relationships between Muslims and non-Muslims. Our first response was collaboration on Friday, Feb. 24 with representatives of Forsyth County’s three Islamic mosques – Annoor Islamic Center in Clemmons, The Community Mosque on Waughtown Street and Masjid al-Mu’minun on Harriet Tubman Blvd. – to invite members of the community to open houses at the mosques. Several hundred people came, many entering a mosque and meeting a Muslim for the first time. Since then, representatives of Interfaith Winston-Salem have continued to work with representatives of the three mosques to identify other ways to build understanding. Approximately 20 members of the mosques have volunteered to meet with non-Muslim groups. Over the last few weeks we have met with representatives of the Southern Province of the Moravian Church, the Cooperative Baptist Fellowship, the Yadkin Valley District of the United Methodist Church and individual Presbyterian and United Methodist churches. While tailoring future Muslim-Christian gatherings to specific needs and situations, we will be using two primary models. The goal in both cases is to avoid “talking to the choir,” to reach people who have neutral or negative impressions of Muslims and Islam. 1. In planning for the Moravian Church Missions Society meeting in August, we will ask representatives on the Society board to invite someone who they know has concerns about Muslims or about the Islamic religion. 2. The recommended basic format for other gatherings is to have at least one Muslim meet with non-Muslims in small groups around tables to discuss questions, share values and talk about how they live out the calls of their faiths. The sessions will conclude with comments from table leaders and answers to questions submitted in advance. We expect to use this format when we meet with members of Redeemer Presbyterian Church in Winston-Salem in July. As we move forward with the meetings, we will make adjustments to ensure that everyone is gaining the greatest benefit. Interfaith Winston-Salem welcomes other churches and groups to contact us if they would like to be part of this ongoing effort. We can be reached by email at interfaithws@gmail.com.